People who love rough sport, certainly can not go past the Boxing ring. In order to achieve excellent results, the athlete needs good quality gloves. However, before you go buy them, you need to find a good Boxing bandages. After all, they are wound on the hand. If you decide to do Boxing, pick up high-quality Boxing bandages. The fact that they should put up the Boxing gloves. It is so organized production of these products. In that case, if Boxing will be the child who only tries his hand at this sport, buy the short bandages. Their length is on average 2.5 meters. It is so much need in order to wind the brush completely, but it does not fix the fingers. But seniors should only purchase long Boxing bandages. With their help, holding up a fist and brush. Don't worry about costs a lot of time, because very soon even a 4-metre strips will be wound in a few minutes. In this long Boxing bandages fix all the fingers and prevent various injuries. 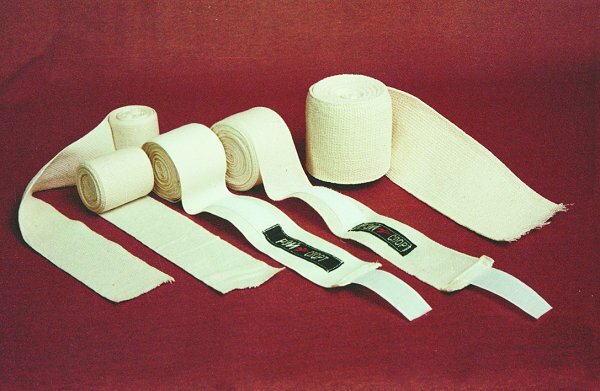 As for the material of which is made a Boxing bandage, then there are two options: elastic and cotton fabric. Again children should use Boxing bandages cotton. This is due to the fact that toddlers can accidentally pull the hand so that the fingers will swell. This has a negative impact on the results of the battle on their health. But if you are an adult and prefer elastic, feel free to use it. But again – be extremely careful while winding, all the time careful how tight bandage. In addition, forget about the fact that Boxing bandages are designed to absorb sweat. It is a myth. As practice shows, during their normal exercise produces a large amount of fluid, which remains on the fingers. Thus, the gloves are still suffering. In order to solve the problem with unpleasant smells, and will buy regular cotton gloves in one of the hardware stores. They will perform the function of socks, only wear them on hands.